What do you know about sunfish? Well they’re fun to catch! There are many species of sunfish (e.g., blue gill, green, longear), and they are very common in Texas. What do you know about them? Before determining this, you should realize that although they lack the renown of bass and many other fish, sunfish can be beautiful. Moreover, if a fisherman uses light tackle, he can get an awesome fight after hooking one. 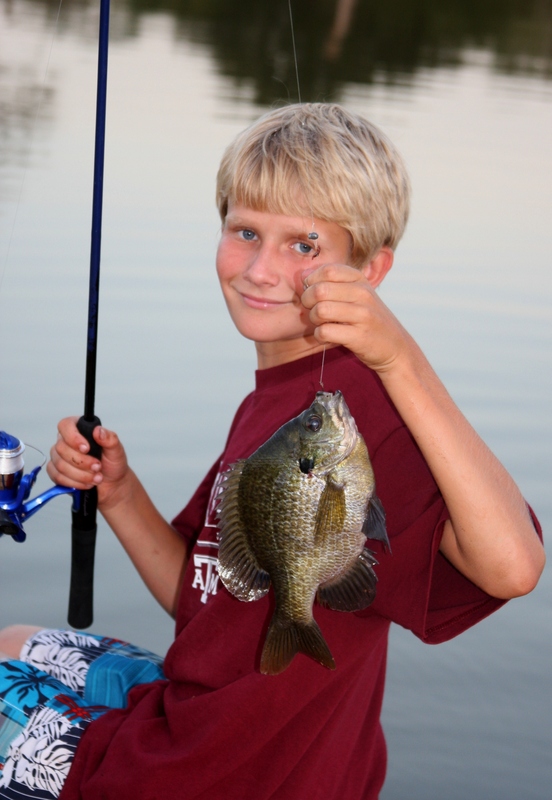 Indeed, sunfish have provided hours of fun for anglers or all ages, especially children. So, what do you know about sunfish. Sunfish are not classified as a game fish. Hence, in Texas, you can catch and keep any sized sunfish, and any number of them (Klym,M. and G.P. Garrett. Non-Game Freshwater Fishes. TPWD. http://www.tpwd.state.tx.us/publications/-pwdpubs/media/pwd_bk_w700_0798.pdf). All sunfish species belong to the fish family, Centrachidae – which, believe it or not, also includes large- and smallmouth bass. Sunfish are also known as bream, brim and pan fish. The latter name comes from the fact that all of these species are relatively small, compact fish that, with few exceptions, readily fit in a frying pan. Most Texans call sunfish, “PERCH.” However, this name is a misnomer when used to designate a sunfish since there really are fish that are perch and not sunfish. 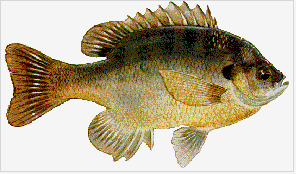 Consequently calling sunfish, perch, is misleading, and can be confusing. The dorsal (top) fin of sunfish is supported by bony or horny spikes (look at the dorsal fin of the sunfish). These spines help protect the sunfish from predation (from being eaten). As you can imagine they are hard to swallow from behind when the dorsal fin is erect. The names of the different sunfish species generally allude to a distinguishing characteristic (e.g., green, long ear, red ear, red bellied and blue gill). 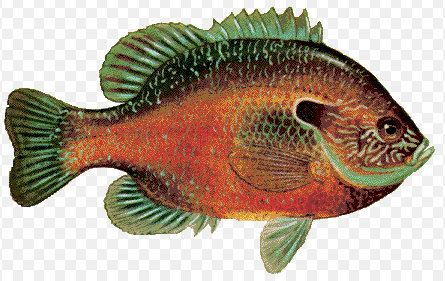 For example the blue gill sunfish has a dark (black or dark blue) spot just to the rear of its gills. Blue gill and other sunfish generally live in the shallow waters of lakes and ponds or in the slower flowing areas of streams and small rivers. Very interestingly, these fish usually have a very limited home range, i.e., about 320 square feet, during non-reproductive months. 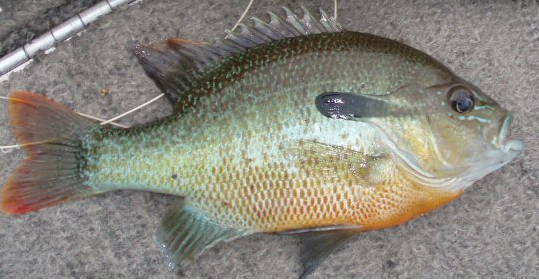 Sunfish will hit artificial lures, e.g., popping bugs and dry flies. Keep in mind that with the exception of the warmouth, they have small mouths. During the mating season, it is the male sunfish that prepares the spawning bed and protects the eggs. During this time they tend to be very protective and will attack most anything that comes near their nest, humans that approach too close. And finally, did you know there is an invasive species form of the sunfish? 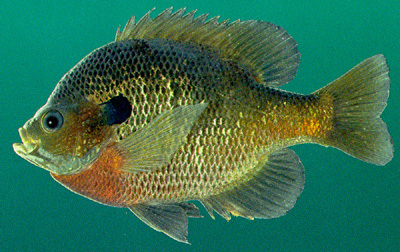 The redbreasted sunfish was first noticed in Texas waters in the 1960s. It has already been responsible for putting a number of Texas native sunfish on the endangered list. The redbreasted sunfish competes directly with the longfish sunfish, plus it carries parasites that endanger the Texas ecosystem. We are so lucky here in the hill country that there are so many opportunities to get involved in fishing. For example, you can hook up with the folks at the Inks Dam National Fish Hatchery. They do an amazing job. They supply over a million fish to help maintain stock of bass, trout, catfish to streams and lakes across 5 states. They have a keen interest in preserving endangered species and even have special aquariums set up at the hatchery just for those fish. 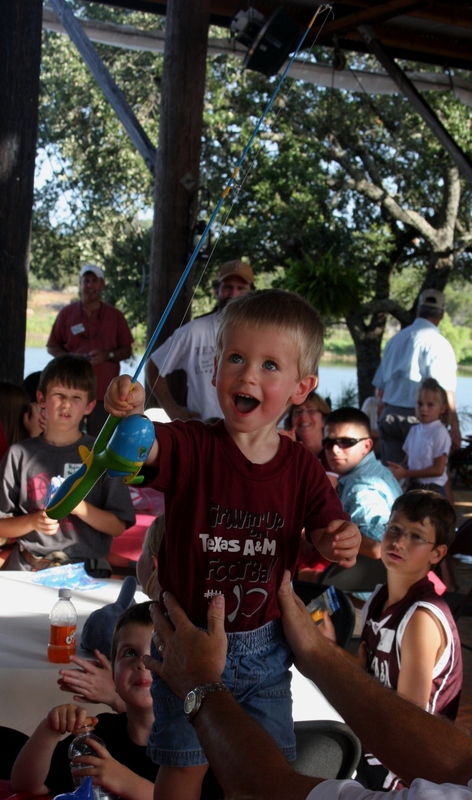 Let’s admit it… fishing is fun… even if it’s with your very first fishing pole. Previous PostHerons and Egrets — Birds of a FeatherNext PostThe butterfly nursery takes shape!